Bill Of The Month: $1,496 Kerydin Prescription Was A Costly Surprise : Shots - Health News A prescription for a drug called Kerydin depleted one woman's health reimbursement account without her even knowing it. When should health care providers broach costs with patients? 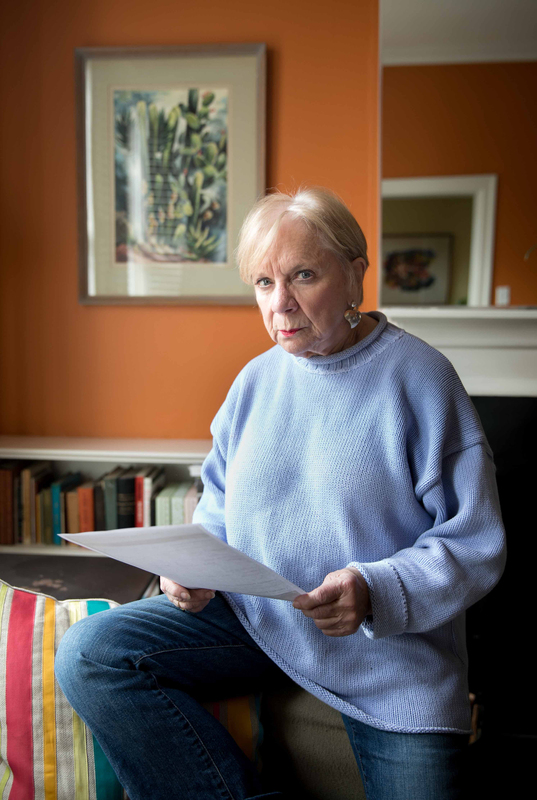 When Anne Soloviev, a retiree who lives in Washington, D.C., received a prescription to treat toenail fungus, she never thought to ask how much the medicine cost. It seemed like an easy fix to an inconsequential health issue. "I did not ask how much it cost — it never crossed my mind, ever," said Soloviev, a former French teacher, who still works part time. Patient: Anne Soloviev, 76, of Washington, D.C. The bill: $1,496.09 for Kerydin, a topical medication that treats toenail fungus. Originally produced by Anacor Pharmacueticals, the drug is now a product of Sandoz, a division of Novartis. Medical treatment: The antifungal medicine arrived by overnight mail, and an automatic refill came a few weeks later. She began using it on the two toenails, as directed, having been told it would take about 11 months to treat her feet. Soloviev, a widow, has robust insurance. She is covered by Medicare, parts A and B, and has supplemental insurance through her late husband's government health benefits that covers prescription drugs. She also has a health reimbursement account, which receives almost $1,500 pre-tax each year to pay for uncovered medical expenses. She typically uses the HRA money to cover copays for the other medicines she takes regularly. But when Soloviev went to her local CVS to pick up another medication — a cholesterol-lowering statin that is usually paid for by her HRA — she discovered her reserve was empty. Unbeknownst to her, the Kerydin charges had wiped out her entire health reimbursement account. What gives: According to Leslie Pott, Sandoz vice president of communications, Kerydin is patent-protected and priced "at parity" with its one market competitor, Jublia. She also pointed out that to secure a place on an insurer's list of approved drugs — its formulary — the company often had to offer substantial discounts to insurers and various middlemen. "We have no visibility into the extent to which these discounts are passed onto patients or payers," she wrote in an email. In the application for Food and Drug Administration approval granted in 2014, Anacor Pharmaceuticals highlighted that a year-long treatment of Kerydin completely cured toe fungus in 6.5 percent of patients for one trial and in 9.1 percent of patients in another. There are many treatment options for toenail fungus — both older medicines in pill form and newer topical treatments such as Kerydin, said Dr. Shari Lipner, an assistant professor at Weill Cornell Medicine in New York and director of its nail unit. The patient in this case would have been a candidate for "quite a few" of them. Patients are likely to pay less for the pills, she said, and they also seem to have greater efficacy. Health plans also are less likely to cover the newer treatments, such as Kerydin. If they do, they often require patients to try the less expensive options first. After a proper diagnosis based on a nail clipping or scraping, Lipner said, patients should be offered all the options and be counseled about their proper use. For example, the oral treatments usually last three months while the topical medicines must be used for a year. And, especially for the newer ones, like Kerydin, insurance coverage can be limited. Cost is likely to be something patients will want to consider, Lipner said. The bill for a toenail fungus remedy came as big surprise. Xavier Davis, Braun Dermatology and Skin Cancer Center's practice manager, said a drug's price tag simply isn't a factor when prescribers recommend a course of treatment. "When our providers are treating patients, we're not treating them based on what the cost's going to be. We look for what's the best care for the patient," Davis said. "If the patient calls and says that's too expensive, then we'll look for alternatives." But patients often don't see the actual price until it's too late. In January, Soloviev's insurance plan was billed the full price of Kerydin. Of that, $1,439.57 came from her HRA. 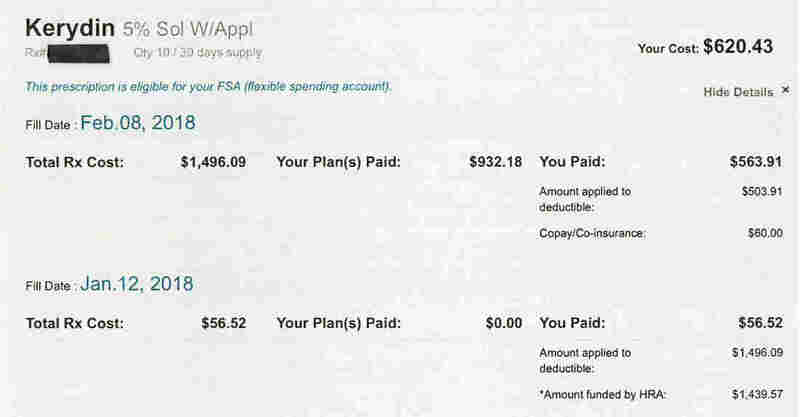 The difference, $56.52, was covered by a patient-assistance program from the drug manufacturer, explained Jonathan Lee, a pharmacist for My Express Care. In February, when her prescription was refilled, Soloviev's plan was again billed the full price. But she didn't know about that either. A manufacturer coupon was applied to cover what remained of her insurer's $2,000-annual deductible and the $60 copay. Her insurance then kicked in to pay the difference. CVS Caremark, the pharmacy benefit manager that administers the drug coverage for Soloviev's plan, said it was structured to pay for such an expense automatically, using the HRA. Had the HRA been structured differently, the coupon may have covered more of the costs upfront, said company spokeswoman Christine Cramer. Meanwhile, Lee, the pharmacist, said even he didn't realize that money could be withdrawn directly from a patient's HRA without her knowledge. "I just find it is outrageous for a fungal medicine to cost $1,400, to be prescribed for 11 months, and for neither the P.A. nor the pharmacy to warn you," Soloviev said. Resolution: Although Soloviev told My Express Care not to renew the prescription, her HRA is depleted. For the rest of the year, she'll have to pay out-of-pocket costs for any other medications, an expense she hadn't planned on. The takeaway: Medical professionals should talk with patients about the options for treatment and what the costs will be. That is especially true if they are recommending a high-priced medicine. Patients should take nothing for granted and ask about the cost of every new prescription. And, because costs can vary depending on coverage, they may need to contact their insurance carrier or the pharmacy benefits manager that handles their medicine claims. Finally, patients should ask again at the pharmacy – even if that means calling a mail-order pharmacy. It never hurts to ask whether there are generic or over-the-counter alternatives. This is a monthly feature from Kaiser Health News and NPR that dissects and explains real medical bills to shed light on prices in U.S. health care and to help patients learn how to be more active in managing costs. Do you have a medical bill that you would like us to see and scrutinize? Submit it here and tell us the story behind it.